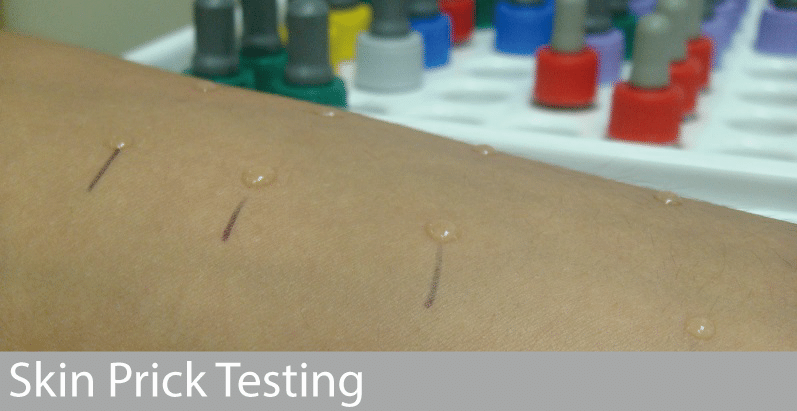 Skin prick testing involves placing a drop of a commercial solution of a suspected allergen on the forearm and then pricking it with a small lancet. The procedure is well tolerated and causes minimal discomfort. Testing can be undertaken at any age (including young infants). The response can be measured within 10 minutes. Anti-histamine medications should be discontinued for at least 3 days prior to an appointment with Dr Orton. Medicines that contain antihistamines include certain cough medicines and anti-itch medicines. If in doubt please check with a pharmacist. Antihistamines do not affect blood allergy testing and should not be discontinued in patients taking them for urticaria/angioedema. It is important not to stop any other anti-allergy medications that you maybe taking (e.g. nasal sprays or asthma pumps). If you suspect fresh fruits, vegetables, fish or seafood of causing symptoms (e.g. apple, pear, cherries, kiwi, celery , prawn, crab) it is helpful to bring these along to the appointment to be used for skin prick testing as the commercial skin prick test solutions may be less reliable. If in doubt please check with Dr Orton’s secretary.